Elon Musk said rides on the high-speed Loop transit system could cost as little as $1 during an event on Thursday. Musk said a Loop system could take passengers from downtown Los Angeles to Los Angeles International Airport in eight minutes. According to Musk, Loop pods will hold 16 people and travel at 150 mph. 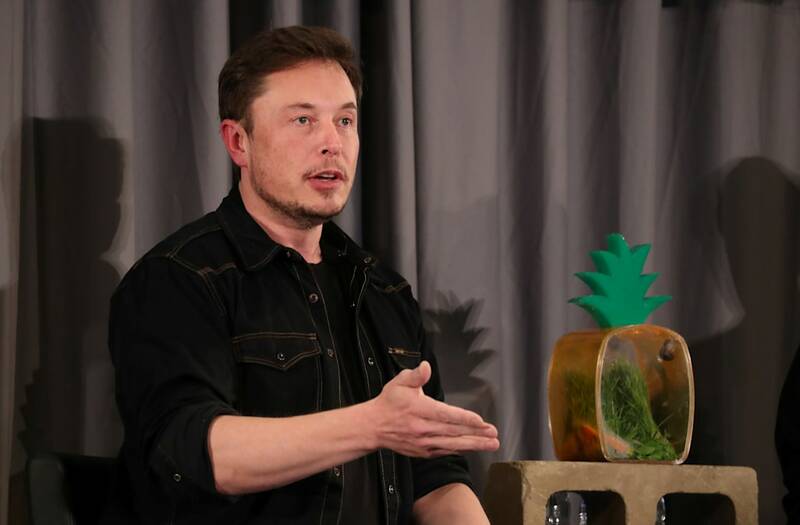 During the event, held in a Los Angeles suburb, Musk and employees from his tunnel-digging company, The Boring Company, discussed the company's progress and answered questions. Musk and The Boring Company had previously said the company's tunnels could be used for the high-speed Hyperloop and Loop transit systems. On Thursday, Musk offered more details about how a Loop system in Los Angeles could work. Musk said a Loop system could take passengers from downtown Los Angeles to Los Angeles International Airport in eight minutes. He also said rides could cost as little as $1. Elon Musk speaks at the Hyperloop pod competition on January 29, 2017. To accelerate the development of a functional Hyperloop prototype, a high speed transportation system that Musk proposed in 2013, SpaceX staged a student pod competition. An employee carries out final checks on a vacuum system before delivery to the Hyperloop transportation system technology applications company at the Oerlikon Leybold Vacuum GmbH factory in Cologne, Germany, on Thursday, June 30, 2016. In 2013, billionaire Elon Musk first unveiled his vision of a transportation system in which capsules hurtling on a cushion of air would whisk people at 700 miles per hour, traveling from San Francisco to Los Angeles in half an hour. The rLoop team shows their INFIRA pod during the SpaceX Hyperloop competition in Hawthorne, California on January 29, 2017. Students from 30 colleges and universities from the US and around the world are taking part in testing their pods on a 1.25 kilometer-long Hyperloop track at the SpaceX headquarters. Sand rises from the track as a test sled is slowed during the first test of the propulsion system at the Hyperloop One Test and Safety site on May 11, 2016 in North Las Vegas, Nevada. Hyperloop One stages the first public demonstration of a key component of the startup's futuristic rail transit concept that could one day ferry passengers at near supersonic speeds. People photograph the interior of a Hyperloop tube after the first test of a propulsion system at the Hyperloop One Test and Safety site on May 11, 2016 in North Las Vegas, Nevada. The company plans to create a fully operational hyperloop system by 2020. SpaceX CEO Elon Musk(C) speaks during the SpaceX Hyperloop pod competition in Hawthorne, California on January 29, 2017. Students from 30 colleges and universities from the US and around the world are taking part in testing their pods on a 1.25 kilometer-long Hyperloop track at the SpaceX headquarters. The EDGE pod, the smallest hyperloop pod designed by Keio University in Japan, is displayed during the SpaceX Hyperloop competition in Hawthorne, California on January 29, 2017. Students from 30 colleges and universities from the US and around the world are taking part in testing their pods on a 1.25 kilometer-long Hyperloop track at the SpaceX headquarters. Robert 'Rob' Lloyd, chief executive officer of Hyperloop Transport Technologies Inc., gestures as he speaks during Automobility LA ahead of the Los Angeles Auto Show in Los Angeles, California, U.S., on Wednesday, Nov. 16, 2016. The Connected Car Expo and LA Auto Show press days have merged to form AutoMobility LA. The show is open to the public November 18-27. A winch supports screws before being inserted into a Dryvac compressing screw vacuum pump at the Oerlikon Leybold Vacuum GmbH factory in Cologne, Germany, on Thursday, June 30, 2016. In 2013, billionaire Elon Musk first unveiled his vision of a transportation system in which capsules hurtling on a cushion of air would whisk people at 700 miles (1,130 kilometers) per hour, traveling from San Francisco to Los Angeles in half an hour. An employee holds a bearing ring during the assembly of a Dryvac compressing screw vacuum pump at the Oerlikon Leybold Vacuum GmbH factory in Cologne, Germany, on Thursday, June 30, 2016. In 2013, billionaire Elon Musk first unveiled his vision of a transportation system in which capsules hurtling on a cushion of air would whisk people at 700 miles per hour, traveling from San Francisco to Los Angeles in half an hour. A Hyperloop tube is displayed during the first test of the propulsion system at the Hyperloop One Test and Safety site on May 11, 2016 in North Las Vegas, Nevada. The company plans to create a fully operational hyperloop system by 2020. A recovery vehicle and a test sled sit on rails after the first test of the propulsion system at the Hyperloop One Test and Safety site on May 11, 2016 in Las Vegas, Nevada. Hyperloop One stages the first public demonstration of a key component of the startup's futuristic rail transit concept that could one day ferry passengers at near supersonic speeds. People look at a demonstration test sled after the first test of the propulsion system at the Hyperloop One Test and Safety site on May 11, 2016 in North Las Vegas, Nevada. The company plans to create a fully operational hyperloop system by 2020. A test sled is propelled along a set of tracks during the first test of the propulsion system at the Hyperloop One Test and Safety site on May 11, 2016 in North Las Vegas, Nevada. The company plans to create a fully operational hyperloop system by 2020. The pod displayed in the booth for MIT Hyperloop, The Massachusetts Institute of Technology, during the SpaceX Hyperloop Pod Competition in Hawthorne, Los Angeles, California, U.S., January 29, 2017. The pod cover for team Openloop, a six school alliance including Northeastern, Memorial University, Princeton, Cornell, Harvey Mudd College and the University of Michigan at the SpaceX Hyperloop Pod Competition in Hawthorne, Los Angeles, California, U.S., January 29, 2017. Team members from WARR Hyderloop, Technical University of Munich place their pod on the track during the SpaceX Hyperloop Pod Competition in Hawthorne, Los Angeles, California, U.S., January 29, 2017. A student from the Delft University of Technology inspects the team's pod before it enters the Hyperloop test track. To accelerate the development of a functional Hyperloop prototype, a high speed transportation system that Musk proposed in 2013, SpaceX staged a student pod competition. Hyperloop, first proposed by Musk in a 2013 white paper, would carry passengers in pods at speeds of over 600 mph. Loop resembles Hyperloop but would be used for shorter distances that require slower speeds. Musk said Loop pods would hold 16 people and travel at 150 mph. He also said a Loop system could be accessed by dozens of small stations that would transport passengers underground and take up as much space as a parking spot. Before Thursday's event, the Los Angeles County Metropolitan Transportation Authority (MTA) said it would allow The Boring Company to build a test tunnel under one of the busiest roads in Los Angeles, Sepulveda Boulevard. The tunnel will be nearly three miles long. Musk founded The Boring Company in 2016. The company has proposed building tunnels in Los Angeles, New York, Chicago, Baltimore, and Washington, DC, and had previously received approval to dig a two-mile test tunnel in Hawthorne, California, dig a 10.3-mile tunnel beneath Baltimore, and begin preliminary work in Washington, DC. On Friday, Musk posted a video of the Hawthorne tunnel on Instagram and wrote that it was "almost done." He also wrote that The Boring Company would give the public free rides through the tunnel in the coming months, pending approval from regulators. In March, Musk said the company's tunnels would prioritize pedestrians and cyclists over cars. He added that the company's tunnel networks would also transport cars, "but only after all personalized mass transit needs are met."